Today is the last day of the Mysore Dasara, an annual 10-day festival in the southern India city of Mysore (a.k.a. Mysuru), in which elephants play a very prominent role. That role is a controversial one, especially to those of us who think elephants should be left alone in the wild. Be that as it may, there is a new twist to the scenario: a bull market for elephant poop. Because the elephants are religiously revered and they represent the different gods of Hinduism, reports the Star of Mysore, their dung is considered holy. Not only is the dung considered holy, but it is also believed to have a variety of medicinal qualities, curing “complications in postnatal care, knee problems, high temperature,” as well as (some believe) reducing body temperature “by standing on elephant dung” (without shoes, that is). 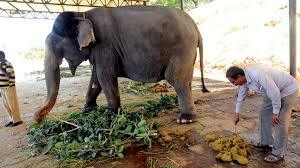 There certainly is no shortage of it: Each of the dozen elephants normally consumes up to 550 pounds of food daily, an amount that is increased during Dasara, “as they have added activities, they are fed more” — and thus more dung is produced. The rough estimate is that these dozen elephants collectively produce an average of more than 1,000 pounds of poop per day.